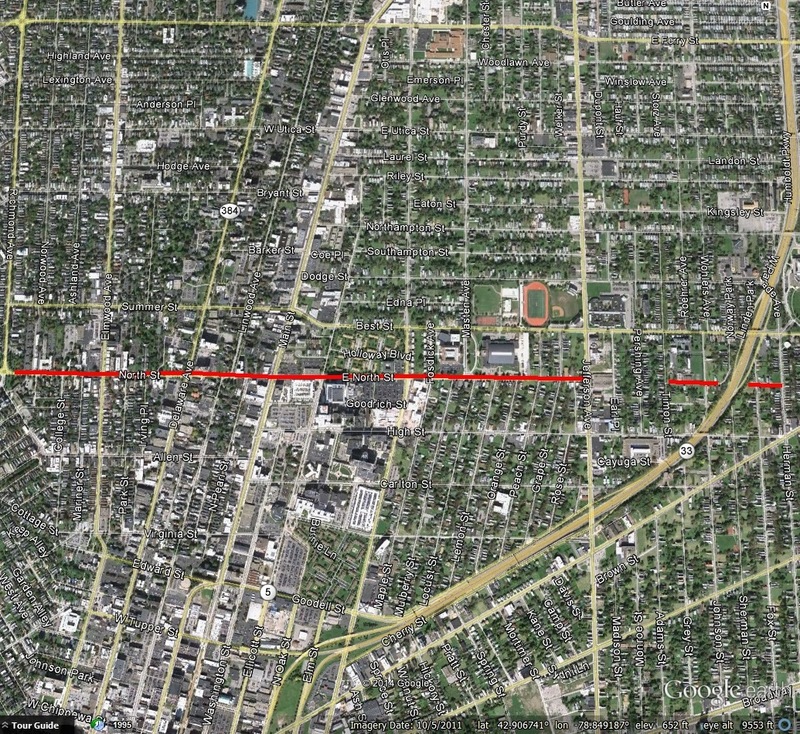 North Street: Massacre, Boundary Line, and an Unbuilt-Expressway? North Street runs through the Allentown neighborhood of Buffalo, between Symphony Circle and Jefferson Avenue. A small portion of East North Street exists east of Jefferson, divided by the Kensington Expressway. North Street was originally known as Guide Board Road. In front of the Episcopal Church of the Ascension at the corner of Linwood and North is a sign that states “Guide Board Road directing pioneers from the east to the Black Rock Ferry”. 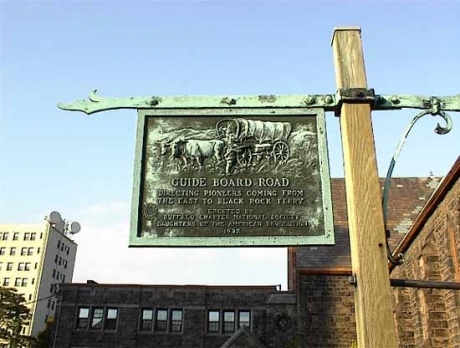 The Guide Board Road was established shortly after Buffalo was settled. Pioneers cut through the woods so that early residents could get from Main Street to the Black Rock Ferry. The road was used by many covered wagons of pioneers and ox carts of the early farmers. During the War of 1812, when Buffalo was burned Dec 29, 1913, Guide Board Road was bathed in blood. While retreating, American soldiers from Buffalo and Black Rock used Guide Board Road to get to Main Street to escape to Williamsville or Batavia. Many of them were overtaken by the Native American allies of the British troops, scalped, tomahawked and robbed of their clothes. Their bodies were left by the roadside. The street was the northern boundary of the City of Buffalo when it was incorporated in 1832, hence the name North Street. The City founders felt that the North Street boundary would give the City plenty of room to expand. The road was also known as Lover’s Lane and Cemetery Road. 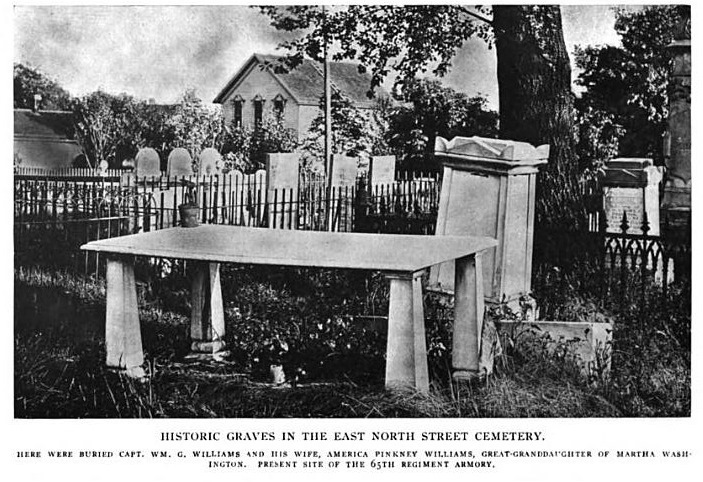 As cemeteries were being moved to outside the boundary of the City, North Street was bordered by six cemeteries at one time! The Erie County Almshouse (and associated cemetery) was located near the location of D’Youville College today. 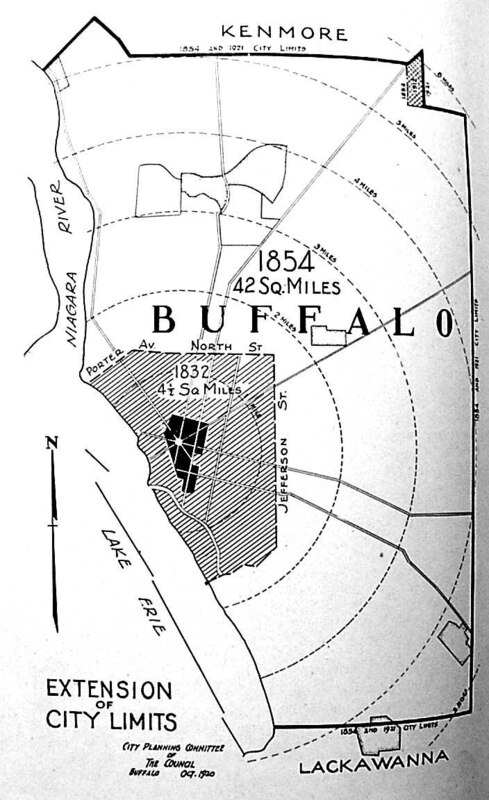 The area around North Street was first settled by residents of Buffalo looking to build houses in the Country. Additionally, immigrants settling in the Buffalo area bought the land along the road west of Delaware for orchards and truck farms. This section became known as Shingletown. Buffalo continued growing and quickly grew to be larger than the Village of Black Rock. Just 21 years after the City was incorporated, the New York State legislature gave permission to extend its boundaries and absorb Black Rock. Plans had been discussed many times over the City’s history to extend North Street. This was discussed as early as 1884 when a resolution was passed to extend North Street from Jefferson to Genesee Streets, but the idea was protested. Plans were resubmitted in 1887. Portions of East North Street east of Jefferson were built. In the 1920s, a plan was put forth to widen North Street and extended it to connect to the east with Humboldt Parkway. The Buffalo City Planning Association proposed this link, which would connect the waterfront to the eastern part of the city to create a crosstown connecting parkway within a short distance of the downtown business district. The new parkway would connect D’Youville College, Holy Angels Academy(which later moved to North Buffalo), the State Normal School (later Grover Cleveland High School), Masten Park High School(now City Honors), the 106th Regiment Armory, the proposed municipal stadium at the corner of Jefferson and Best Street (which became War Memorial Stadium aka the Rockpile, now John Wiley Sports Complex), and the proposed Natural Science Building to be located in Humboldt Park (today the Science Museum). The proposed parkway would be a double roadway and was intended to provide relief from congestion currently occurring on streets such as High Street. The planned width of the street would be 105 feet wide with two 27-foot roadways separated by a wooded park strip. One unique thing about the proposal was that the road was planned to take North Street over Main and Ellicott Streets, as well as to tunnel Franklin, Linwood, Delaware and Elmwood Avenues under North Street. The road was designed to separate the crosstown traffic from the north and south traffic. This road was never built. If you could redesign any street in Buffalo, which would you change? “Urges Action on Widening of North Street”. Buffalo News, July 13, 1923. “Cross-Town Street Plan is Explained”. Buffalo Evening News, February 17, 1928. “War Wealth Park of North Street History”. Courier Express, Feb 9, 1956. Picture Book of Earlier Buffalo. Buffalo Historical Society Publications: 1912. Very interesting as always! Thank you.